The Danube Region is an area of Europe with high potentials of biomass resources, and many studies point out the comparatively high biomass potential in the Central European region in the forms of different forestry and agricultural residues. However, in order to exploit these resources, considerable investments are needed to build biorefineries, trigger market demand for bio-based products and guarantee the security and sustainability of the long-term biomass supply requiring active involvement of farmers. These challenges are sizeable, and call for a holistic approach, a transition period and harmonized policy support. However, the authors believe that the transition can speed up with the involvement of industry players, building on existing value chains and infrastructures, all placed in an enabling and business supporting environment. In this chapter, the authors aim to introduce the Danube Region and its potentials in sustainable biomass resources, providing an overview of main supply chains and players as well as of policy instruments and constraints that are currently slowing the development of the bioeconomy. 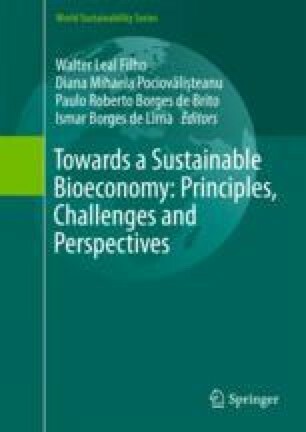 Based on the current situation and its critical analysis, the authors propose a strategy that can move forward the bioeconomy in the Danube Region and probably multiplied also in other geographical areas. In order to realize the multiple benefits and decrease the financial and market risks, in this chapter, we will introduce circular economy and sustainable intensification approaches that build on industry involvement in order to obtain working business models. This approach could facilitate the bioeconomy transition by merging novel technologies into working value chains to valorize by-products and could make stakeholders interested by providing an additional revenue stream instead of waste management fee.